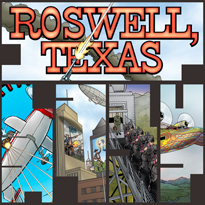 "Wild Bill" and his Texas Rangers ride again, this time in a hi-rez, full color PDF release of the popular alternate history story from Prometheus award winner L. Neil Smith and cartooning legend Rex F. May (a.k.a. "Baloo"). Now readers can enjoy the full effect of Scott Bieser and Jen Zach's marvelous art for this fantastic tale of strangely familiar people living in a stranger world that is all too familiar. Be the first kid on your block to get this gem of a story, now available @ DriveThru Comics.